OK, I'm just kidding. I don't intend to do this every year. 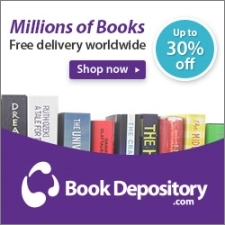 Be that as it may, Vintage Novels is in for another facelift, brought to you this time with the amazing help of Website Creation NZ. Don't get too nervous: it's just the look and flavour of the site that will change, not the navigation. Still, I've been meditating on the current look for a little while and coming to appreciate its shortcomings. Over the next week or so there may be a bit of tweaking and adjusting happening as I update to the new theme and refine the new look for greater readability. I've been away staying with friends for a couple of weeks, as I do from time to time, to run the house and care for the children after a difficult birth. Another friend dropped by at one point in the festivities, with a gift for the children: Thomas the Tank Engine: The Complete Collection, by the Rev W Audry. There are people whose literary recommendations I take with a grain of salt, and there are people whose lightest word causes me to rush off and add things to my Goodreads To-Read list. The donors of this book were among the latter. Still--"Thomas the Tank Engine! Really?" I said. "Well, it's like Winnie-the-Pooh," said my friend. 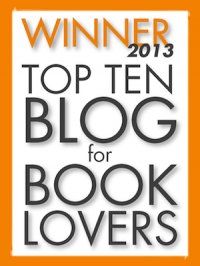 "There are the Disney travesties--and there are the original stories, which are wonderful." "Like The Jungle Book," I agreed, and so I sat down with the children and dug into the real Thomas the Tank Engine. 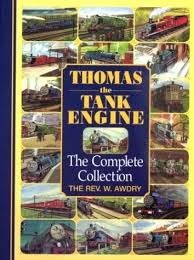 The Rev W Audry originally penned 26 short collections of short stories about Thomas, Edward, James, Gordon, and many other steam engines on a variety of different railway lines on the fictional Island of Sodor. The stories were published between 1945 and 1972, before Audry ran out of steam (couldn't resist) and illustrated beautifully in full colour. The first collection didn't even include the character of Thomas. If you've read books like Edith Nesbit's The Railway Children, you know that before the end of steam, people became railway enthusiasts, charmed by the unique personalities of the different trains that roared by their sleepy country villages. Nesbit's book, also for children, distilled this charm and fascination into the story of three children finding a home and growing up after the disgrace and imprisonment of their father. With much the same inspiration Awdry took a different tack: he makes the engines themselves characters, and follows them through a series of adventures based on real-life railway incidents. All over Britain, rail enthusiasts and rail workers praised the stories for their authenticity. The children I read to were spellbound by both pictures and stories. The stories are particularly good: very short and very simple, most with some nice clear edifying moral that doesn't smack you between the eyes yet is perfectly clear to the youngest child. The word that sums them up best seems to be satisfying, for I got as much enjoyment out of them as the children did. Here's why. The characters are well-drawn. It seems strange to talk of steam engines as being human, but that's what they are--well-defined characters with both good and bad points. The stories usually end with disobedient engines being reproved and punished, or obedient engines being rewarded. Like in real life, there are always consequences for actions. But, the stakes and consequences are always authentic railway predicaments. This last point is where The Railway Series always shines. So, in one story, the drama is provided when one of the engines, Percy, is asked by another engine to make sure the Vicar and his Children's Outing get home safely. Percy would rather be at home in the shed, but remembering his promise to see the Vicar home, presses on through a storm and even gets stuck in a flood. The moral is hardly new--one must keep one's word, even when it is difficult to do so--but the backdrop of authentic railway life gives heft to the story. In the very next story, Percy gets fat-headed from his triumph over the floodwaters, drives a foolish bargain with some trucks, and ends up plunging into sea-water. 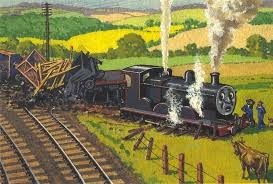 The Fat Controller scolds him for disobedience and he is sent for repairs. This quirky combination of fable and realism is what makes the stories work so very well. Though I haven't had the chance to read every single one of the Railway Series stories, I hugely enjoyed the ones I did read, and so did the children. A great read-aloud choice for boys particularly. Get Thomas the Tank Engine: The Complete Collection from Amazon or The Book Depository (affiliate links). I want to review a bit more non-fiction here at Vintage Novels, and this one is a great book to start with. 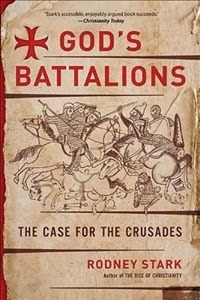 I highly recommend God's Battalions to anyone who wants a really Christian perspective on the Crusades. It's a brief but gripping overview of the history, necessarily ultra-condensed, but providing a framework to correct some common misconceptions about the Crusades. I have long believed the Crusades to be, as Stark argues in this book, wars of defense on the part of the Christians, sorely provoked by centuries of Muslim oppression of Christian lands. Though I've held this perspective for a long time, much of what Stark says in his book was new to me. For instance, I had been happy to agree with scholarly consensus that the Fourth Crusade's sacking of Constantinople was an indefensible act of vandalism. I'm not ready to excuse the thing altogether, of course, but by the time Stark told the full story of that event, I wasn't amazed so much by the sacking of the city as by the Crusaders' forbearance in not sacking it a century or so earlier! I thoroughly enjoyed every minute of God's Battalions--I realised while reading it that all the enthusiasm other people expend on supporting their favourite sports team is given by me to the millenia-long struggle between Christendom and Islam. This book was like getting a front seat at a big match. I cheered. I wept. And, as I went, I wrote down five things that occurred to me to be good lessons we can learn from this period of history. 1. Division within the church is a sin that leads to severe judgement. I've now read a few different accounts of the rise of Islam as a global force, in the age of expansion immediately after the death of Muhammed during which Muslim forces conquered Syria, Egypt, North Africa, and Spain. All these accounts (notably God's Battalions, Christopher Dawson's The Making of Europe, and Isaac Botkin and David Noor's Navigating The Worldviews of Egypt) emphasise the fact that in many of these places the Muslim armies were welcomed by local Coptic and Nestorian Christians who preferred the rule of these pagans to that of the Orthodox church of Constantinople. During the ensuing occupation, the screws were gradually tightened on the local Christians, and today the descendants of those who welcomed the invaders have either apostasised to Islam or are ruthlessly persecuted by the Muslim overlords. Meanwhile, their eagerness to welcome the invaders exposed Christian Europe to threat. Whether the discord between the churches was the fault of the Orthodox, or of the Copts and Nestorians, both have suffered from it ever since. 2. Do not rely on others to defend you. Stark argues that the Muslims were able to conquer so many Christian lands not because of superior bravery, and not even so much because of superior technology and tactics. Neither the provinces themselves, nor the Byzantine/Roman armies, were defended by disciplined citizen soldiers. 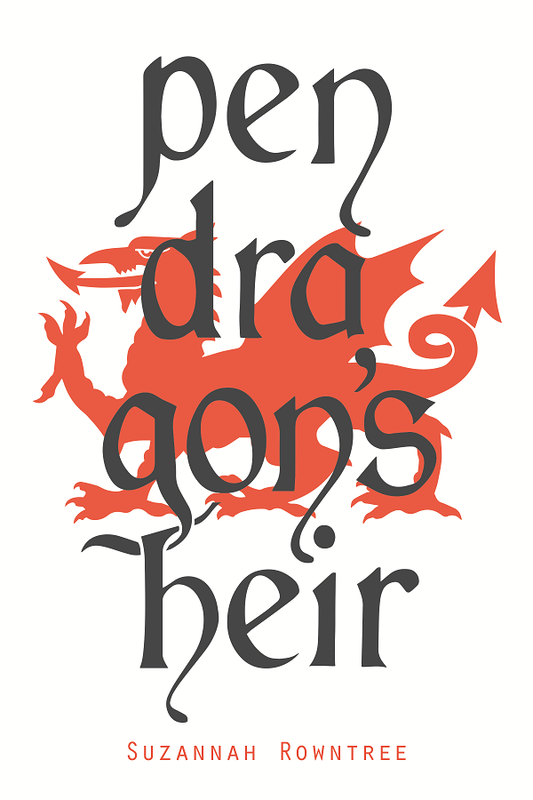 Instead, the armies were mainly composed of mercenaries serving for pay. Stark says, "Many of the rank and file in the Byzantine and Persion forces were Arabs, large numbers of whom ended up deserting to the Muslim side...at critical moments." The professional Byzantine soldiery took only a defensive part in the war. It seems that the provinces themselves were not actively defended by their own people, in the way that Alfred's Wessex (for example) was. Instead they relied on the centralised power of Byzantium, which could not provide enough troops and therefore had to hire treacherous mercenaries to defend them. 3. A people that can't work together will be uniquely vulnerable to militant, well-disciplined, aggressive Christian attack. Historically, where Muslims have been opposed by disciplined, aggressive Christians, they have been easily beaten at least partly because of their own inability to work together. In Spain, the great Christian warrior El Cid was exiled from his homeland of Castile and, unable to aid the reconquista from the Christian side, was soon gainfully employed helping the Spanish emirs fight each other. In Sicily and southern Italy, reconquest of occupied territory was helped along by the same Muslim disunity. One major exception to this tendency was Saladin, sultan of Egypt, who managed to unify Islam under his leadership and successfully re-took Jerusalem. Otherwise, Muslims just don't generally get along with each other well enough to invade or occupy places successfully. Bojidar Marinov's article, Civilisation and Self-Control, might explain why. 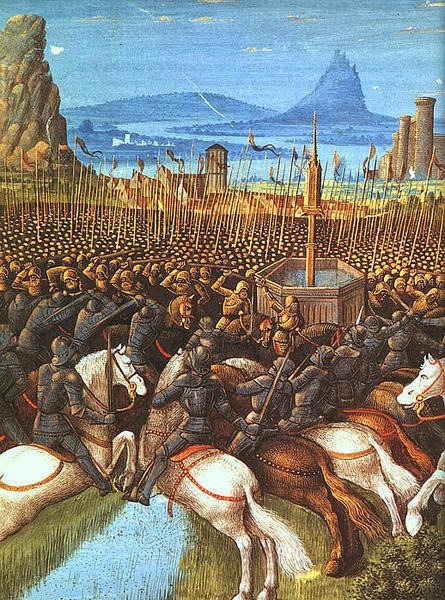 Of course, the Crusaders also sometimes failed to work together or yield to just authority. It was this that caused the massacre of Peter the Hermit's People's Crusade. A lack of discipline and good leadership in Christian forces made them as vulnerable as the same shortcomings made the Muslims. 4. A people that steals and exploits technology will be uniquely vulnerable to anyone who pioneers and develops technology. Historically, Muslims have been better at pirating (and occasionally banning) other people's technology, rather than developing their own. The navies occasionally built by Muslims are a good example. Muslims hired renegade Christians to build and crew their ships, and copied the designs of Christians. They were thus always technologically out of date, and (see point 2) reliant upon mercenaries. Similarly, Western innovations in wheeled transport and mounted warfare (such as the swivelling axle and the stirrup) put Islam at an increasing disadvantage. Technological leaders and entrepreneurs were able to soundly out-think and defeat copy-cats and coattail-riders. 5. Families sharing a common vision can accomplish amazing things. Stark discusses the research of Jonathan Riley-Smith, who investigated exactly who, of the best and brightest of European nobility, set out on the Crusades. He came to a number of intriguing conclusions, one of which was that "crusading was dominated by a few closely related families!" As Stark puts it, it was not individuals who responded to the call for a Crusade, but families. Count William Tete-Hardi of Burgundy had five sons and four daughters. Four of the sons went on the First Crusade and the fourth became Pope Calixtus II who sent a mini-Crusade to attack Damascus in 1122. Of the daughters, one sent a son and the other three all sent husbands to the First Crusade. The same family sent ten more members to the Second Crusade. Many other families followed suit. This was at least partly because almost nobody could go crusading without strong family support. Crusading, contrary to popular opinion, was ruinously expensive and was done without hope, promise, or realisation of financial reward. Without family support, few of the participants could have scraped together the resources to go. Yet, because these families shared a common vision, this massive enterprise was sustained for nearly two hundred years. Right up to the fall of the last Crusader holdings in Palestine in the 1290s, the same group of families continued to bear the majority of the financial burden of the Crusades. Rodney Stark's book, chronicling the desperate, heroic, but ultimately hopeless history of the Crusades and the kingdoms they built with so much blood and toil in the Holy Land, left me with one question. And, because they were wiser in their day than we our in ours, the Crusaders themselves had the same question. Why did God permit their defeat? Why did Outremer fall? Of course, crusaders were not particularly holy or obedient men--but the question of why and how they failed is one that I'll look forward to researching in more detail another time. Get God's Battalions from Amazon or the Book Depository (affiliate links).